I'm a mother of two who first got braces at age 41 (ceramic uppers and metal lowers for almost three years). Here you see a photo of me in braces, and later after braces! Shortly after I got my braces in early 2001, I felt dissatisfied with the orthodontic items readily available to consumers in local stores. I just couldn’t easily find what I needed to keep my braces clean and comfortable. Even my own orthodontist didn’t know where I could buy some of the things I wanted. So, I took the task upon myself, and created the website you see today. First, I created the DentaKit Braces Survival Kit. It took months of research and product testing. I personally tried each and every component that went into the kit, while consulting with several orthodontists for input. I searched high and low (and worldwide) to include only the best, most durable products -- items you really need to clean your braces on the go, like the durable Swedish folding cup! As time went on, DentaKit.com grew and so did our product offerings. Our site branched out to include new and innovative products to help with orthodontic hygiene and pain relief, oral irrigators, retainer cleaners, aligner removers, and special products for after jaw surgery. I joined several dental associations and went to their meetings and trade shows to seek the newest products and learn about new trends in orthodontics. I’m not a dentist, but I have learned a great deal about dentistry and orthodontics directly from the professionals and industry experts. For more than 16 years, our site has kept growing, and now includes more than 125 helpful products specifically for people with orthodontic braces and retainers. I’m proud to say that we have tens of thousands of satisfied customers in more than 70 countries -- and tons of positive website reviews and product reviews! 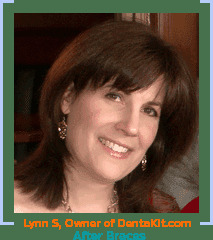 DentaKit.com is a small family business, which gives us the flexibility to cater to your needs and offer you outstanding customer service. We ship our orders the next business day from a professional warehouse, so you get your stuff fast! And if you have a problem, we help you within 24 hours (usually you will receive a reply within only a few hours after sending your question or request). When you buy the products we offer, you can have confidence that they were tested and considered by a real person who understands the challenges of wearing braces, just like you or your kids! We never sell anything that I haven’t personally vetted. Another reason to buy from us: we get our products directly from the manufacturers on a regular basis. All of the products on DentaKit.com are genuine and fresh. Do you really want to shop with those large impersonal websites and auction websites for these types of products? Who knows where their products came from or if they are counterfeit? When you buy from us, you can be assured that you will not only get a “real” product, but that you will understand what it will do for you, why you need it, and how to use it properly. I have personally written all of the product information on this website. The product descriptions, FAQ, photos, and videos all aim to answer any questions you might have about a product. Are you an adult orthodontic patient who wants to connect with other adults in braces, or ask a question to an orthodontist? 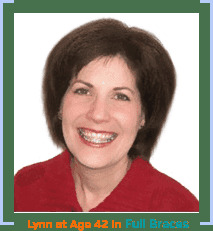 If so, we offer the Metal Mouth Message Board on our informational sister site, ArchWired.com. The Metal Mouth Message Board has been around since about 2004 and has thousands of members around the world, including several orthodontists. You’re only a click away from getting the advice you need! 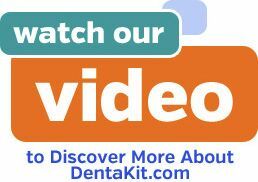 I hope you enjoy using your DentaKit Braces Survival Kit and the other products we carry, and that they make your orthodontic experience more pleasant. Our customers worldwide love our products, and I'm sure that you will, too. Here's to a healthy, straight, beautiful smile!